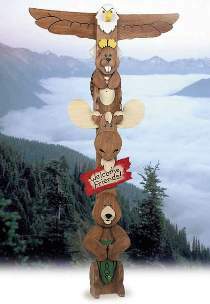 This totem pole includes a family of forest friends to welcome your guests. The center is a 10 ft. length of "2x8" of which the bottom 2 ft. are buried in the ground. The overlay pieces that make up the forest figures are cut from 3/4" and 1-1/2" stock. Patterns are drawn FULL SIZE. Order three pair of brown eyes and two pair of yellow eyes separately below.